So I decided to finally make that plunge and do a show. I have been telling people for years that I was gonna compete soon, and my amazing girlfriend was the push I needed to finally do it. She told me she was going to do a show sometime right around her graduation. Not only is she going to school full time finishing her PHD, she works as a Teachers Assistant and helps me out with bodywork on my clients when she can. Her plate is so full and her determination inspired me. I decided 2 weeks out to enter the last NPC national qualifier of the year, Excalibur. There were things that were holding me back from competing sooner. I didn't like the ambiguous nature of judging for men's physique, the way the posing is done, the complete omittance of leg development, the ever increasing size of the pros, and most notably the politics. But in reality, the thing that was holding me back was my fear of failing. My fear of failure or rejection has often reared it's ugly head in relationships, jobs, school and all other aspects of life. I often did not fully apply myself to situations because I was worried that if I did invest completely and tried my hardest, I would have no excuse to fall back on if and when I failed. This fear is surely what kept me from telling anyone I was going to do a show including my: friends, family, clients, and even Emmeline who was my inspiration in the first place! I went alone with no support. For some reason I felt I had to. There was a briefing at 8:30am where we went through the stage markers, posing area, order, ect..."What team are you on?" I'm asked by one of the photographers. "Uh.. Um... Team Me?" There is a nervous energy in the empty auditorium as competitors are with their coaches or teams while others are on the phone going over last minute prep with their coach. I feel as if I am the only one who didn't follow contest prep instructions from a coach! Speaking to the competitors, all of them had some kind of prep help. Part of me was proud that I didn't have all the external input the others did, while another part of me worried I had erroneously placed to much faith in myself. When prejudging started we were all in 2 small rooms. I was there very early because I wanted to practice posing and get rid of nervous energy. For the longest time I was in there with just 2 or 3 other guys. One of whom was 54 years old and won the masters 40+ and another was his 22 year old son who ended up in second in his class. I thought that was so cool to see father and son do this together. I also loved that the father beat guys almost 15 years younger than himself! As it gets closer to show start time the rooms become more and more full. Now the vets are rolling in... the ones who didn't need to attend the briefing because they are national level and have done it many times. People are touching up their tans and practicing posing and sizing each other up. Its a competitive but positive atmosphere. Everyone respects each other for having the courage to step on stage. Looking around the rooms and hallways there are a few of us who are standing out as threats to win and being asked questions about diet, training, ect.. Before I know it I have a group of competitors in a circle around me astonished that I prepped for less than 2 weeks. They cannot believe that I sometimes go 20-24 hours without eating, and that I avoid all wheats, grains, gluten, dairy among other things. When I bring up intermittent fasting it seems to be some mythical concept that people are somewhat aware of but do not practice or understand. They talk about the mood changes they had when dieting, and the fights they got into with girlfriends and co-workers. I overheard one figure competitor talk about how she has to order lunch for the whole office to make up for her contest week bitchiness. While I am hearing this I am smiling to myself because my mood was actually getting better the more I went into ketosis. They are astonished to hear that I was eating ribeye steaks, sweet potatoes, and even homemade apple pie up until the show instead of their boiled chicken and broccoli and rice every 2 hours. Before I know it I have 2 new clients who want to try my way of contest prep that doesn't make you feel miserable and "diet" in a way that impacts your mood positively. As soon as the womens physique is done its Men's Novice Physique Class A. I am in Class B and we are lined up in order right outside the stage. I'm watching them and the judges narrow it down to 2 great looking competitors who have a prolonged pose off and you could tell it was very close. As we are called out I feel as though I am a spectator myself, almost as if I was not experiencing it in my own body. There were 12 in my class and I was excited because I thought I had a good chance to win. When the first call out is done I was in 2nd place for a pose or two then they re-order and put me in the center. Our callout was much faster than the previous class and we are dismissed. 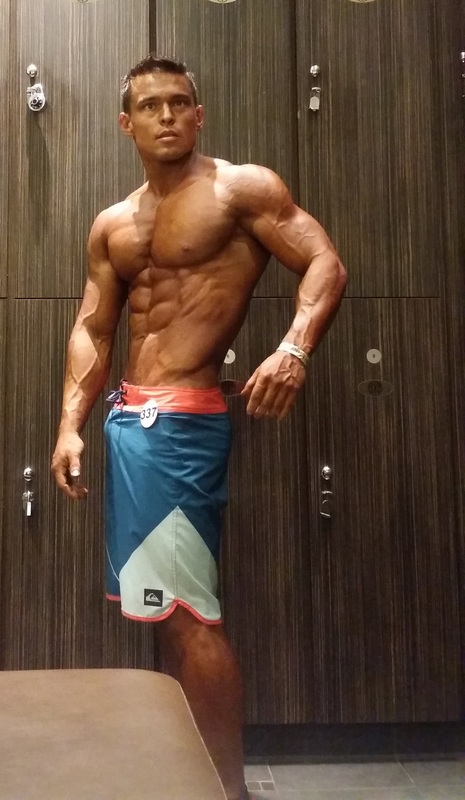 I left prejudging feeling great because I knew I likely won. When I came back for the night show the amount of people I saw replaced that good feeling with nervousness again.. But on stage you don't even notice them.. just the lights and the judges. I won my class and was held back to compete in the overall. The 4 winners including myself came out to compete for the overall. The judges did alot of re-arranging and after what felt like an eternity of posing they announced the overall winner was Class C. After I walked backstage one of the judges came back to me and told me that I needed to work out my posing a little better and I could likely win a national qualifier. So in the end perhaps I should have sought out a little help for posing, but now I am more aware of the things not to do than I would have ever been if I hadn't made those mistakes. I got to feel what its like to win and also what it feels like to come up short all at once. The next show I enter my goal is not to win my class, it's to win the overall and qualify for nationals. I called my girlfriend told her that I entered and won. She was so surprised and proud. I know she wanted to be a part of it but something in me made me feel as though that first show I had to do on my own. But next time we will be doing it together and have each others full support as she competes for her first time in figure. My clients yelled at me for not telling them and letting them come cheer for me. The next show I will have experience, full support, and no coaching so if I come up short I have to know its not because of any shortcoming or lack of effort by me. I can live with not being the best, but I can't live without knowing I tried my hardest to become it. Not just in a physique show, but in all aspects of life. More than anything this experience reinforced what I already knew. That it's not about reaching a certain point of success in an area of life. Its about participating fully in this whole experience and in your passions. Through this you may be able to achieve rare greatness, but you never know until you take away your excuses and give your full effort.